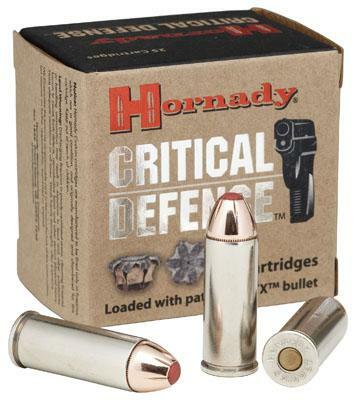 The Hornady Critical Defense line of personal defense ammunition has added 22 WMR, 9x18 Makarov, 44 Special, and 45 Colt to the lineup. Loaded with the patented FTX bullet, these bullets provide consistent expansion through heavy clothing, and won't plug up like conventional hollow points. The 22 WMR delivers terminal performance from a short-barreled firearm comparable to the 380 Auto Critical Defense load. The 9x18 Makarov is optimized to deliver superior expansion from it's 90 gr FTX bullet. The 45 Colt Critical Defense load has been maximized for performance in short-barreled platforms, and is a fantastic choice for the very popular Taurus Judge. Both the 44 SPL and the 45 Colt Critical Defense loads offer real man-stopping power.